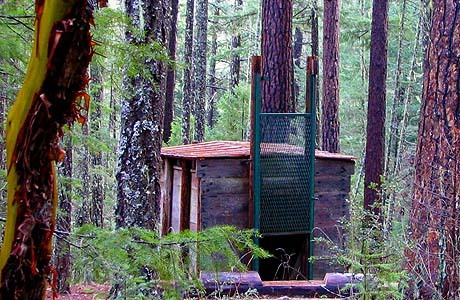 This trail features views of the Siskiyou Crest and Applegate Lake, and it passes an inactive Big Foot Trap as well as a number of mine adits (tunnels with one entrance). Begin at Hart-tish Park picnic area and continue for 0.75 miles to drop down to Grouse Creek reach the old Big Foot trap. From there, the trail climbs rapidly to the ridgeline and begins to travserse the western slope of Collings Mountain. Enjoy a forest of Douglas fir, ponderosa and sugar pine while traversing for the next two miles, and then decline steadily for 3 miles before reaching Watkins campground. The area was named for two brothers who mined in this vicinity during the 1850s and 1860s. In addition, the last 0.5 miles of the trail pass through the 62-acre fire that burned in 1981. From the town of Ruch, go south on Upper Applegate Road for 15.6 miles to reach Hart-tish Park.